These and other duties are made perfectly possible in the seven business sim games for Android and iOS we have lined up below. Feel free to take any of these titles for a spin, but don't forget to stop and take care of business in real life every once and a while! Rollercoaster Tycoon – a PC classic simulator – gets to live a second life on mobile, re-imagined from the ground up! Open card packs full of coasters, rides, and decorations to build your dream park & complete missions to acquire more cards and upgrade your buildings. If you keep the visitors happy, you will keep making more money and growing your park! There's also an innovative, touch-control coaster builder to let you easily draw your own coasters. With the intuitive path and building placement, you'll get to express your creativity and build your dream park! Alternatively, if you're willing to splash some cash and go for an experience similar to the original game, there's always RollerCoaster Tycoon Classic. What's more fitting than a video game where you create and manage your own video game company? In Game Dev Story, you take the role of a CEO of a fledgling game development studio. You can potentially become a multi-millionaire, but the road won't be easy. The title covers a time period of over 20 years and is quite complex - you have to hire and supervise your staff, figure out what type of games to make, at what areas of development to invest funds, how to market your products to gamers, and so much more! The title says it all - build a tiny tower, fill it with little characters called bitizens, and make some money by charging rent and running various businesses as you grow your creation. Tiny Tower is a game we recommend because it's totally playable without using the premium features. However, keep in mind that you'll need to have a bit of patience as building additional floors and re-stocking stores requires time as well as in-game currency. Got gasoline in your veins? Know the closest kin of all the F1 champions by name? And finally, you regard manifolds to be a pristine example of contemporary art? Thankfully, you don't need to meet those requirements to enjoy one of the finest mobile simulation games. Motorsport Manager gives you complete control over your very own racing team. You get to choose in what type of auto sports to compete, which drivers to hire, the desired strategy for specific tracks, plan pit stop breaks, and so much more. The third installment of the game adds a brand new Supplier Network feature that allows players to make their team's presence known around the globe. Also, the game includes so-called Invitational Races, massive annual events that bring international races with a unique twist. As the title suggests, Star Traders technically falls into the RPG category with its turn-based mechanics and ability level up system. However, there is a vast and very intricate galactic economy that makes this title a very interesting blend. You can be a galactic trader, a pirate that hunts merchants along the great shipping lanes, a Solar War military captain, or a fearsome bounty hunter. If you have a thing for pixel-y games with a lot of depth to them, definitely give Star Traders a try. There are no ads or in-app purchases here, so you can enjoy hours of interrupted gameplay. If you want more, you can always spend $3 and buy the elite edition to get additional planets, sectors, and spacecraft. 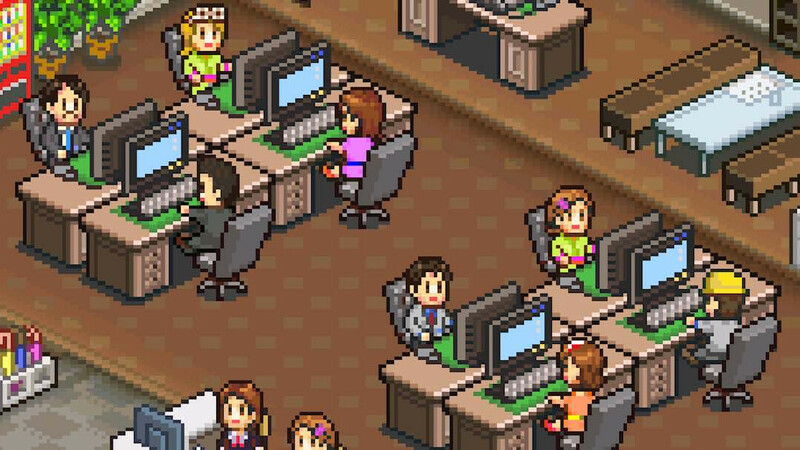 If you're looking for a sim game with some sense of humor, you've got to try Office Space: Idle Profits. It's made for fans of the classic comedy movie. You are a disgruntled employee at Initech and layoffs are imminent. You need a plan to get back at the company – big time. So you team up with Peter, Samir, and Michael to install a virus in the company's mainframe, siphoning out the undetectable pennies out of each department and placing it in your own retirement account. Vile! This is probably the funniest simulator you can play right now. The Westport Independent is an intriguing sim game that's similar in many aspects to the critically-acclaimed "Papers, Please". The game takes you to a post-war country in the mid-40's. On one side, you have the recently elected Loyalist Party that is taking steps to censor the press, while on the other you have the rebels who are trying to launch a coup. As the editor of one of the last independent newspapers in the country, you have the difficult task of juggling between the different factions in an attempt to keep the integrity of your daily journal. Leaning too far on either side can have severe consequences, so tread lightly! Keep your smart games to yourself, we want only mobile trash in our top ten list! :-D But you are 100% right, OTTD is probably the best complex sim on the mobile platform. Sadly I don't really see iOS version on App store? Was it banned (why)? I think it's just on iPads. Correct me if I am wrong. Btw do you play Openttd? How do your games go? ?